Five years ago, New Yorkers were first offered the feast of music and dance that has now become a staple of the otherwise sluggish month of August, Drive East: A journey through South Asian music and dance, initiated by two budding institutions: S Sridhar and Sahasra Sambamoorthi’s Navatman and Sriram Emani’s Indian Raga. Today both organizations are flourishing: Navatman has done the last five Drive East festivals on its own and, this year, ventured to San Francisco as well; Indian Raga continues to produce intriguing (and well-performed) videos of both music and dance. In early 2013, I had suggested to Rama Vaidyanathan that she request Navatman to present her Mad and Divine expecting it to be a stand-alone concert. Imagine my surprise to find the work (commissioned by Anita Ratnam for a Natya Darshan seminar by the same name) publicized as the opening night of a week-long festival that would have forty offerings spread over seven days! Imagine, also, our Indian dance and music community’s awe at reading the extensive coverage given to this first Drive East in the New York and Financial Times! We rediscovered just how much NY dance writers love our classical forms. This year’s sixth festival was most striking for its presentation of (at least) five dancers who augur a wonderful future for Indian dance: three live in India, one is currently in Singapore, the fifth based in Boston. Their works acknowledge the multi-arts sensibilities that characterise the best of Natyashastra ideals in that they incorporate not just movement, but inventive music, unusual slokas, innovative hastabhinaya gestures and even in one case, a spoken text. Also, the dancers I watched possess finely tuned body-instruments, slim, supple and buoyant. Arushi Mudgal: Light-footed, engrossing and lithe - even if her style eschews the nuances of torso that I yearn for - this daughter of the Gandharva Mahavidyalaya (and, thus, Madhavi Mudgal’s) Odissi gharana captivates us with her intelligent and fluid movements. When, at the end of her own composition Murta-amurta, she looks – as Yashodha - into Krishna’s mouth, a moment we associate with T. Balasaraswati’s Krishna Nee, I could have sworn I saw her moist pupils dilate as she registered what she ‘saw’. I was quite impressed. 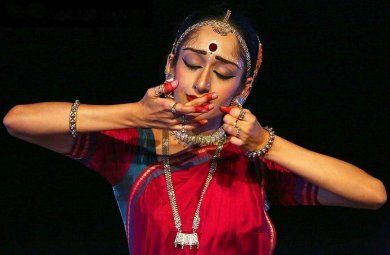 (https://www.nytimes.com/2018/08/21/arts/dance/indian-dance-drive-east-festival.html). Having subsequently heard her speak knowledgably about her ‘domestic’ Sattra and learned of her research, I see her as a beacon for this dance form from Assam that is fast gaining world-wide popularity. Neha Mondal Chakravarty’s Unheard Plea, is the third spoken and danced ‘take’on Draupadi by a Bharatanatyam dancer that I know of (I caught Sonal Mansingh’s at Mumbai’s Nehru Centre in 1994 but, sadly, missed Janaki Rangarajan’s Unravelled at Drive East last year). 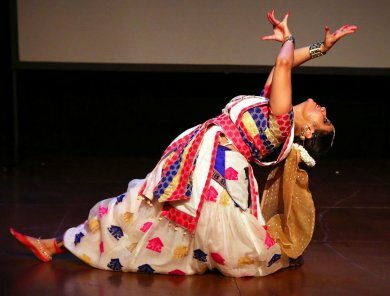 As someone who has developed a form of spoken as well as sung, chanted and danced storytelling that I call Sutradhari Natyam, I was struck by the amalgam of theatrical devices – Indian and western – employed in Neha’s retelling of Panchali’s story from a feminist point of view. Two elements in particular stood out: her use of stage space including the up-down dimension, and the inventive hastabhinaya with which she brings to life Sanskrit texts that tie together her retelling (composed and sung by the ubiquitous Sudha Raghuraman). As examples of the first, her section on Draupadi as maharaagyi, ‘great queen’, benefits from the use of a raised platform as she begins, Uma-like, seated on her throne; a dance depicting Krishna at play with her sakhaa Krishna is performed seated throughout, yet never lacks imagination. The second element prevails in the gestures she coins to make visible Sanskrit texts that serve as connective threads to her narrative; they are unexpected and give you a fresh grasp of the concepts she wishes to convey. Bhavana Reddy: Having learned a few Kuchipudi items with Raja Reddy in the early seventies (and even danced a Bharatanatyam duet with him during a US tour by my mentor Indrani Rehman), I was looking forward to seeing Bhavana live. Yet just two years ago, my co-curator Uttara Coorlawala reminds me, I had found her submission to the Erasing Borders Festival ‘too filmy’, her demeanour almost complacent. I was thus delighted to watch the more intelligent and poised young lady she has become. Still as supple and agile as I remembered from her video, she now adds a mature bearing to her onstage presence. Her show-stopper was a very moving rendition of the bhajan like “Hare Krishna Hare Rama” set to George Harrison’s 1970 chart-topping single, My Sweet Lord, choreographed by her father Raja. I was impressed by the restraint with which the gestures were set. What could have come across as repetitive by a less richly vested performance, left one moved by the simplicity of a single thought: to connect with her lord. It also segued well into the precocious nayika of the Krishna Shabdam during which I found myself chuckling out loud on more than one occasion. Promising as were the above-mentioned performers and their presentations, the highlights of what I attended this year were Mesma Belsare’s Upastuti and In Each is Both, excerpts from a larger work conceived and directed by the brilliant Maya Kulkarni: Shilpa Natana / The Dancing Sculptures. From the moment we hear the unusual opening music with its harkening to primordial time that leads into an imaginative exposition of the well-known pada bheda of Natyashastra and temple sculpture, we know we are in for something ‘extra’-ordinary. I was so mesmerised that I have to admit I barely remember the details. When Maya wrote asking me how I had reacted to her treatment of specific stories or philosophical ideas, I realised that I remembered only some simple iconic moments, like Mesma crossing the stage sideways in Nandi’s swaying gait or the unusual rendition of oft-performed verses from the Ardhanareeshwara stotra that made me receive the very concept of Shiva-Shakti anew. Of late we have become used to unusual texts and inventive additions to Indian dance vocabulary that performers now explore, but the combination of Maya’s profound knowledge of Sanskrit, her unparalleled collection of a wide range of music and Mesma’s brilliant mind-body that follows her guru’s leads is something unique. It takes us into a whole new world of choreographic possibilities that seem futuristic as they simultaneously hark back to the beginning of time. And I wasn’t the only one who felt so. For once, cell phones remained dormant, no one took photos or videos and, until an exuberant standing ovation at the end, it felt as if no one breathed. Rajika Puri, trained in Bharatanatyam and Odissi, now develops a form of narrated, danced and sung stories that arose from her career in western theatre (Sutradhari Natyam), and performs slide lectures that benefit from her MA in social anthropology. She is also co-curator of several New York dance festivals.